TOKYO — Tatsuya Yamaguchi of Japan's star pop band Tokio, who acknowledged last week that he had sexually harassed a teenage girl, says he's quitting the group. 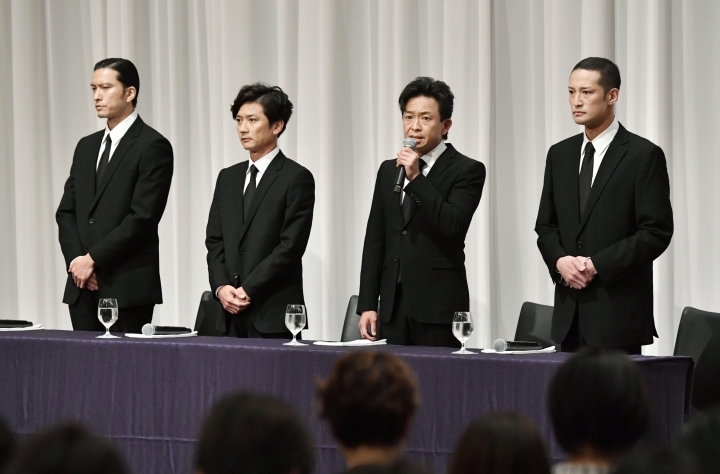 The other four band members appeared at a news conference Wednesday that was broadcast live on national television, making the Tokio scandal one of the most high-profile #MeToo cases to rivet Japan in recent weeks. Tokio leader Shigeru Joshima said Yamaguchi apologized to the other members, getting on his knees in repentance, and submitted his resignation Monday night, but there was no immediate decision whether to accept it. The group won't disband and the other members will continue with any work offered, seeing it as their duty "as professionals," Joshima and the others said. 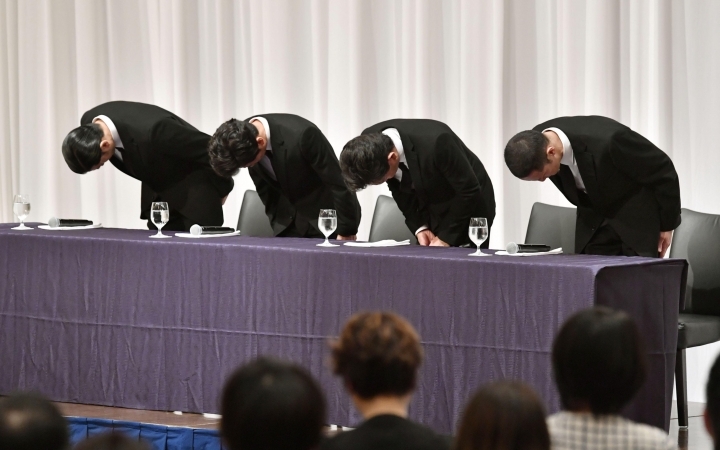 "We have a responsibility first as Tokio," Joshima said, after bowing deeply with the other members. Dressed in dark suits and ties, they appeared solemn and tense before flashing cameras at a packed Tokyo hotel room. Joshima said the group decided to apologize publicly to the victim and her family, the fans and other people who were shocked and hurt by the scandal. Tokio is one of the leading groups under Johnny & Associates, a major Japanese entertainment company, with megahits such as "Ambitious Japan" and "Love You Only." Its members also appear as actors on TV shows and in movies, and also serve as talk show hosts. Tokio was tapped as "special ambassadors" for the 2020 Tokyo Olympics, though it's unclear if the scandal will change that. The group has also been promoting the revival of Fukushima in northeastern Japan, which was devastated in 2011 by an earthquake followed by a tsunami and a nuclear reactor meltdown. Awareness about sexual misconduct has been relatively slow to take off in Japan, where gender equality lags behind other developed economies. But the public attention the Tokio case has attracted is helping to draw attention to the #MeToo movement in the country. Sexual misconduct of a government bureaucrat has also grabbed headlines in recent weeks. The Finance Ministry official, accused of making lewd remarks to a reporter, has resigned. The comments by Tokio's Masahiro Matsuoka seemed to underline a new kind of sensitivity. "I've told him, 'You are sick,'" he said.